Challenging U.S. EPA in court is not for wimps, Georgetown Law professor Lisa Heinzerling is warning her students. Be prepared, she says, for the government to sling legal doctrines at you in an attempt to get the case dismissed. You'll be challenged, she says, on "standing" -- proving your clients are truly harmed by EPA's action or inaction. "The solicitor general," she said, meaning the lawyer who represents the government "has elevated doctrines like these to a high art form." It's more difficult for an environmental group to show it has been harmed by EPA's not regulating greenhouse gases from power plants than it is for power plant owners to say emissions limits undercut their bottom lines. Consequently, she said, these doctrines "skew against" the beneficiaries of regulation -- environmental plaintiffs -- and toward industry and other regulated entities. "That undoes -- in a really sneaky way -- some of the benefits of [creating] administrative agencies in the first place," she told about 35 students in an amphitheater lecture hall. Heinzerling is perhaps the most qualified person to teach these lessons. She is widely credited with crafting the legal strategy of a coalition of states and environmental groups in Massachusetts v. EPA, the landmark 2007 Supreme Court case that held EPA should regulate greenhouse gases under the Clean Air Act. Proving the Bay State had standing was a pivotal aspect of the case. After President Obama took office, Heinzerling joined EPA and in her two-year stint crafted a suite of regulations to address climate change. Now Heinzerling is back at Georgetown Law, leading a beefed-up environmental law program and waiting for the Supreme Court to decide a challenge from utilities and a dozen states to the climate regime she designed to be legally bulletproof (Greenwire, Feb. 24). 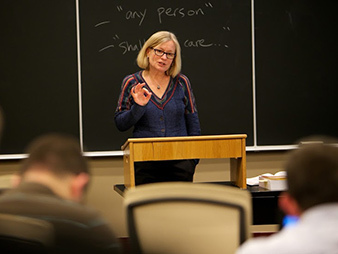 Former U.S. EPA senior climate counsel Lisa Heinzerling lectures her students at Georgetown Law School. Photo by Sam Hollenshead, courtesy of Heinzerling. Meanwhile, the fiercely opinionated Heinzerling has become an outspoken critic of the Obama administration. She claims the White House's Office of Information and Regulatory Affairs, or OIRA, a clearinghouse for regulations before they are finalized, frequently delays or weakens important health protections because of cost considerations. Her sharply worded views have made her a frequent sparring partner with her former law school professor Cass Sunstein, former chief of the White House's Office of Information and Regulatory Affairs (OIRA). But she also doesn't shy away from criticizing EPA for moving too slowly to address climate change. Heinzerling's eagerness to speak out is no surprise to people who know her. Even some of the most accomplished industry lawyers are wary of going up against her. One noted that she "goes for the jugular." Former Supreme Court Justice William Brennan, a liberal lion for whom Heinzerling clerked, had a nickname for her: "Pistol." "She's a sharp thinker, and she stands her ground. She's forceful," said David Doniger of the Natural Resources Defense Council. "Environmental policy is not for weenies. You have to think hard and deep, but you don't win your argument just by stating your arguments. You have to be persuasive and stick to it." Heinzerling, 53, has blond hair and lectures with a quick -- if at times nerdy -- sense of humor that is well-received by her students. Her tidy office includes a framed playing card that depicts Queen Elizabeth II with George W. Bush's face. Also prominently displayed is a small ceramic bust of Data, the artificially intelligent but emotionally lacking android from the "Star Trek" television series. She admits to Trekkie-dom, even scoffing at the recent feature films. "I don't actually watch Star Trek any longer, but I do love Data," she said with a smile. "I will never deny that I love Data." Heinzerling grew up with two brothers in Chaska, Minn., then a rural town about 30 miles from Minneapolis. Her dad was a family doctor and her mom a family lawyer. She enjoyed the outdoors as a girl, and still does. When she isn't working, she enjoys gardening and spending time with her husband, a doctor who develops drugs for a biotech company, and two teenage children. She also runs. She's attempted one marathon, finishing the 1992 Twin Cities Marathon in a respectable 4:07. She struggles to recall exactly what made her decide to go into environmental law but said she was influenced by the first Earth Day in April 1970. She quickly began connecting the environment to her family's everyday routine. She asked her parents to use unleaded gasoline and stop spraying pesticides in their home garden. "I was a big pain in the neck," she said. Heinzerling left Minnesota for Princeton University and then the University of Chicago Law School. There, she took Sunstein's administrative law class and fell for its complexity. "I loved really complicated statutes," she said. "I liked all the stuff that for many people is a turnoff about environmental law." From there, it was on to the Supreme Court and her Brennan clerkship during a very contentious term in the late 1980s. The high court heard several high-profile civil rights cases that year, and its liberal wing -- led by Brennan -- was worried it was losing its grip on the court. It was current Supreme Court Justice Anthony Kennedy's first term, and there was a lot of apprehension about how he would vote. Heinzerling's fellow clerks said she was adept at reaching consensus despite rising tensions among the justices and their clerks. Tim Bishop of Mayer Brown LLP in Chicago, another Brennan clerk who has since argued several environmental cases at the Supreme Court representing industry interests, recalled Heinzerling's diplomacy. "Lisa would often be the one to find the way that everyone would agree on," Bishop said. "She is capable of talking to everyone. That's not always true on that side of the aisle." Heinzerling's dedication to public service was apparent even then, said Eric Rakwoski, a University of California, Berkeley, law professor and another Brennan clerk who remains close friends with Heinzerling. "She was perceived as someone dedicated to doing some sort of work in the public interest," he said. The clerks gathered for weekly drinks that year, and, at one of their final get-togethers, they voted on high school-style superlatives for the group. Heinzerling was named least likely to make a million dollars. Heinzerling later settled in Boston, handling environmental litigation for the Massachusetts attorney general's office. She soon made her first mark on the Supreme Court. Whitman v. American Trucking Associations, which the court decided in 2001, centered on Clinton-era National Ambient Air Quality Standards for smog-forming ozone and particulate matter, or soot. Industry and some states, led by the trucking association, challenged various aspects of the limits, including whether EPA should have considered the costs of implementing the standards on the regulated community. After losing in a federal appeals court on other grounds, EPA turned to Heinzerling to write briefs for its Supreme Court appeal. Heinzerling argued that the relevant section of the Clean Air Act did not authorize EPA to consider costs in setting air standards. The Supreme Court agreed unanimously in an opinion penned by conservative Justice Antonin Scalia. Five years later, Heinzerling -- then teaching in her first stint at Georgetown Law -- was approached again by a coalition of a dozen states and about a dozen environmental organizations to draft its court documents in Massachusetts v. EPA. NRDC's Doniger was involved in that case, and he recalled Heinzerling's crafty way of making sure the case got the justices' attention so they would agree to review it. In the coalition's initial petition, the first of two questions Heinzerling listed for the court was not whether EPA has authority under the Clean Air Act to regulate greenhouse gases -- the most important issue in the case. Instead, it was whether the agency can decline to set air standards based on policy considerations not enumerated in the statute itself. That question framed the case as a blatant violation of an administrative law principle. "That principle applies no matter what the facts are," Doniger said. "It made for a clever [certiorari] petition." Once the case was granted review by the court, Heinzerling flipped the questions in her briefs. Heinzerling recalled reading as much as she could about the court to get a sense of the justices' mood and what might appeal to them. She also said she believes in writing lively briefs. "People have different opinions on this, for sure, and I think I'm in the minority," she said, "but I do think that it is nice to write a brief that is arresting, that has a bit of life to it." When she joined EPA in January 2009 as senior climate policy counsel, Heinzerling sought to implement a theory that lies at the root of her feud with conservative critics. The Clean Air Act, she believes, provides a solid foundation for regulating greenhouse gases. "I'm with everyone else that it would be nice to have a tailor-made statute for climate, for sure," she said. "But I think the Clean Air Act has done a pretty good job." With her help, EPA quickly issued its finding that greenhouse gases do, in fact, endanger public health, and released standards for auto tailpipes. That then triggered regulations adding greenhouse gases to a permitting program for new or modified industrial sources, requiring them to use the best available technology to limit emissions. Heinzerling also helped draft the "tailoring rule," which raised the amount of emissions a source must put out before it qualifies for the permitting program. The rule was designed so thousands of small sources -- such as hospitals and apartment buildings -- wouldn't be required to obtain permits just because of their carbon emissions. Heinzerling left the agency at the end of 2010, keeping her promise to return to Georgetown after a two-year hiatus. It also coincided with midterm elections in which Democrats suffered significant losses in Congress. That led to some speculation that Heinzerling either was forced out or resigned out of frustration that EPA wasn't moving faster in issuing climate regulations. Heinzerling flatly denied the rumors of her being forced out. "Simply not true," she said. She did, however, acknowledge some frustrations at the agency. She noted that successful regulatory programs need a long lead time, so there should be a "pipeline" of rules in the works in order to make a lasting, long-term impact. Heinzerling said such a strategy was lacking for EPA's climate office after the initial set of regulations was issued. The agency is set to propose next week the highest-profile climate rules of President Obama's second term, greenhouse gas standards for existing power plants, but they are coming after EPA missed a court-ordered deadline. "It did strike me that there needed to be a plan not just for things being done at the moment but what are you going to do in the future," she said. "I don't think everyone was on the same page about that." For example, there have been numerous requests from environmental groups to add greenhouse gases to standards for various pollution sources such as oil refineries or industrial boilers. EPA's response, Heinzerling said, has largely been that such an action is something it would like to do, but that it won't right now or it might in the future. Often, EPA says it lacks the resources to put together such regulations. Under that reasoning, Heinzerling said, "you're not going to get to those, maybe not in this administration. And that's bad. That's bad." Further, when EPA is challenged on that response in court, it is creating what Heinzerling called "destructive law" every time a court upholds its justification. Such precedents, she said, could allow a more conservative administration to delay rulemaking indefinitely. Those criticisms of EPA, however, are minor compared to Heinzerling's thoughts on OIRA. She acknowledges that typically officials are reluctant to criticize the White House after they leave their posts ("People don't do that," she says), but says she felt compelled to after Sunstein began publicly defending OIRA's cost-benefit analyses. Sunstein has written a book on the importance of regulatory cost analysis to the country's economy, as well as a Harvard Law Review article defending OIRA's policies. "Once I saw someone out there on the public record giving one point of view," she said, "I felt like that, as a tenured professor, if I am not able to speak my mind about it, then nobody is ever going to." Heinzerling has pointed to extensive delays between when an agency submits a rule to OIRA and when it is finally issued. She has called OIRA an opaque operation where a "shadowing mélange of possible characters," largely composed of industry interests, can influence policy (Greenwire, Feb. 20). In short, Heinzerling argues that OIRA provides another venue for well-moneyed interests to lobby against regulations. Heinzerling isn't entirely against taking cost into consideration when developing public health protections like air standards. But she says that decision should be left to the relevant agency, not OIRA, which doesn't have the same expertise. If there is "a gray area," she said, "it should be the agency's call," noting that the Supreme Court earlier this year upheld EPA's consideration of cost in implementing its cross-state air pollution program (Greenwire, April 29). Heinzerling's crusade against OIRA and the consideration of cost in public health regulations has made her no friends among industry and, in particular, within the electric utility sector. Scott Segal of Bracewell & Giuliani LLP, the director of the Electric Reliability Coordinating Council -- a utility group -- said Heinzerling's views "stretch" EPA's regulatory authority to its "breaking point in an attempt to address carbon issues through the Clean Air Act." Further, Segal, another frequent debate opponent of Heinzerling's, said OIRA plays an important role of serving as a backstop for regulations. It "ensur[es] that President Obama's own cost-benefit commitments are met and that a degree of quality control exists in estimating the real impact of rules," Segal said. "Undermining OIRA is no mere intellectual concern," he added. Heinzerling, however, shows no signs of letting up. Since she returned to the law school, she has been named its Justice William J. Brennan Jr. professor of law. She used her acceptance speech to blast OIRA, something she also did at another recent environmental event hosted by the school. OIRA, she said, "is where regulations go to die." She said she feels "completely lucky" to have had her time at EPA and is appreciative of the hard work EPA does and, in particular, the agency's staff. But she won't, she said, let that stop her from speaking out. "I have to say it," she said, "partly because the agency actually needs people to press them from that direction, because they are going to be pressed from the other direction all the time -- constantly. It's nonstop. Unless there is some counterpressure, then the temptation will always be to move in one direction instead of the other."